Ever wanted to feel as if you own the road, no matter what the driving conditions? Then get ready to take the wheel of the new 2018 Range Rover Velar—and suddenly, you’re the king of the road. Perhaps it’s the height of the Velar, the mid-size luxury SUV that joins the Range Rover family with an entirely new look and feel. Sitting in the driver’s seat, your outlook is well above most of the other vehicles around you, with a long view of what’s coming up, be it traffic on Second Avenue or the snow-covered approach to Whiteface. Add in the wide stance of the Velar and the total control found in the combination of all-wheel drive with Range Rover’s traction technologies and this is an SUV that does make you feel like the master of any terrain. It’s a fitting way for Land Rover to celebrate 70 years as one of the world’s toughest automobile brands. It’s also a very long way from the original Rovers, which were modeled after World War II Jeeps and also had four-wheel drive shafts and a stripped-down interior and exterior. But the Range Rover Velar is anything but stripped down. Beginning with the sleek modern exterior, a beautiful iteration of the mid-size SUV with cool features like a racy roofline, inset door handles that pop out for entry and a pool of light by the front doors that automatically guides you to the entry; it really is a luxurious way to travel. At a base price of $49,000 and a top-range of $89,300, it needs to be, as entering the luxury market with competition already in place from the Porsche Macan, Mercedes-Benz GLC, Audi Q5 and others, the Velar obviously must stand apart—and it does. Inside, the newly developed InControl Touch Pro Duo “Infotainment” System consisting of two ten-inch touchscreens that include the controls for the climate, media, phone, seats (including massage, cooling, and heat) and—bringing the fun to the driving—the Terrain Response functions. Those change the Velar’s settings to what’s out there, ranging from Eco to Grass-Gravel-Snow, Mud-Ruts, Sand, Comfort, and Dynamic; there’s also the optional Terrain Response 2 system, which allows the car to select the best mode for whatever surface automatically and conditions it senses you are driving on. More control is at your fingertips, too, with paddle shifters on the steering wheel, for the moments you want to put the Velar automatic transmission through its paces. Meanwhile, those who wish to surrender to this state-of-the-art vehicle have the option of letting it do just about everything—keep you in your own lane, automatically brake when it senses an emergency in the making, park the car itself and even monitor your alertness. Some of those bells and whistles may be a bit much for those of us that adore driving a fully responsive automobile, but each of those elements is at your discretion on the Velar. You can drive this Range Rover that comes in three engine types (a 2.0L Inline 4 turbocharged diesel or gasoline version, or a 3L supercharged V6 gasoline 380 hp beast) with as much or as little assistance as you need in any given moment, which might just come in handy on slippery mountain roads come winter. Like most luxury mid-size SUVs, the Velar has adequate inside storage space, especially with the passenger-seat row folded down. The rear door opens hands free, with just the kick of your foot, and the roof retracts to let the sunshine in and the wind ruffle your hair just a bit. Expect to get city-highway combined gas mileage ranging from 20 to 28 per gallon, depending on the model you choose. 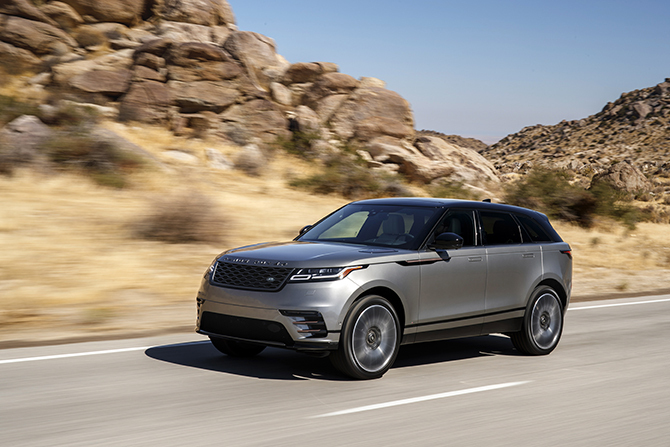 For more information on the Range Rover Velar—and the entire Land Rover/Range Rover line, visit landroverusa.com.